I'm so excited! I got the new laundry drying rack I ordered. That's 79 more feet of drying space, baby! You see, I've been exclusively drying all our clothes outside for the last month since the weather has been so nice and dry. And warm. Of course, it's August so that helps considerably. We were going to install something more permanent outside, but I wanted something that could be used both indoors and out. Mostly because we live in Seattle and 9/12 of the year, it's too cold and drizzly to successfully dry outside. 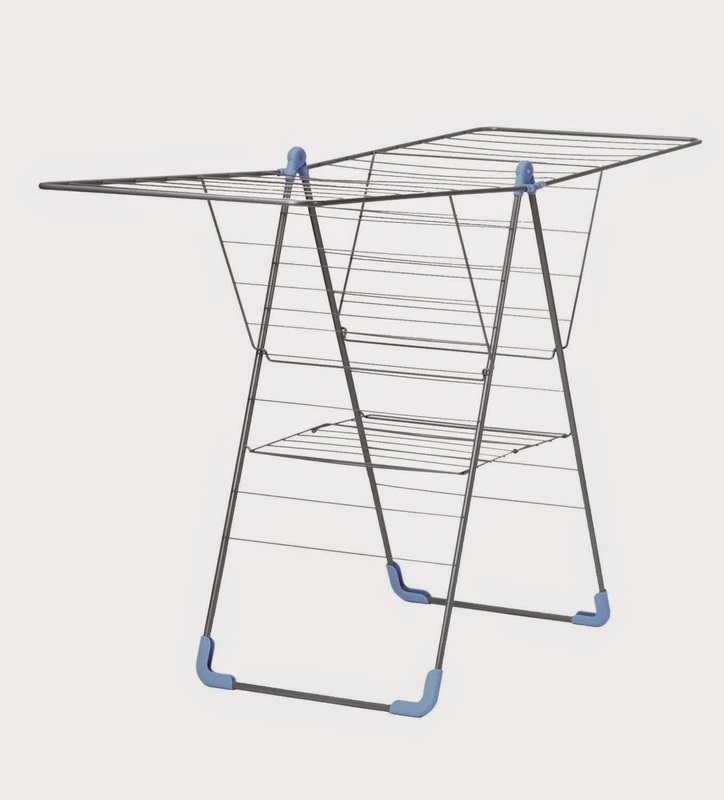 I've tried drying our clothes indoors during the winter, but generally give up because it takes so long to dry (several days) and I run out of rack space. So, in order to keep the air drying going, I figured I'd solve that problem by investing in more laundry drying racks. And, I've also decided that putting the racks not in the laundry room (which tends to stay fairly cool) but in the family room downstairs (with the vent opposite our oil heater) should make the clothes dry faster. In any case, I'm pretty excited to continue line drying, even throughout the year. I'm very interested to see how it affects our electricity bill as well. Seattle City Light started sending us comparative reports on our electricity usage and I'm embarrassed to say that it's much higher than I'd like. A lot of that is because my son does part-time homeschooling so the space heater is going a lot during the day. And everyone likes to leave the lights on in the house wherever they go. Anyway, I'll report on the impact of reduced dryer usage on our bill as time goes on. What about you? Do you line dry at all? If so, is it yeare round or just during the summer? Warning: There be affiliate links in this here post to help support giveaways and such like. We have always line dried. As a kid we had outdoor clotheslines and indoor ones down in the furnace room for the winter. I line dry outdoors as much as I can but in the winter I line dry indoors. We have a woodstove so our indoor air is very dry and hanging clothes indoors helps to humidify. I turn a fan on to help blow out the wrinkles. The only time I use the dryer is if we have a long spell of wet weather (rare) or the sheets and towels in winter. Most people who live in my part of the world (Atlantic Canada) have outdoor clotheslines. that looks just like our laundry drying rack! we use ours just for clothes that shouldn't be put in the dryer. the rest of the wash does go in a dryer, because we live in an apartment with a laundromat around the corner and no outside line. but when i had a yard last year, i didn't set up an outdoor clothesline then either because i realized it would be hella annoying to carry giant bags full of wet, heavy laundry down the street back to my apartment. I line dry year round. I live in Toronto, so much of that time the line drying is indoors. I have a couple of laundry racks, and I hang bigger items over the banister. I rarely use my dryer. 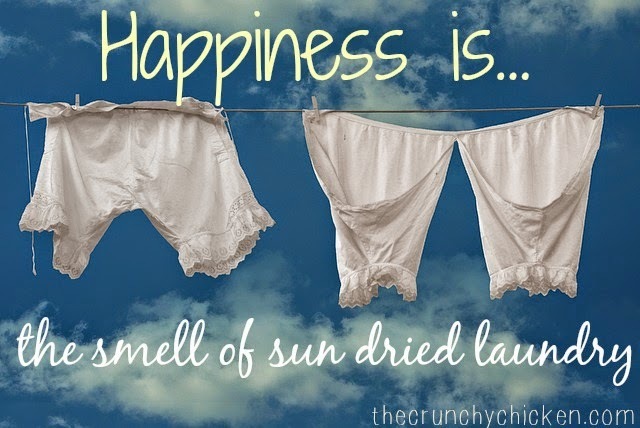 I line dry all year round in England- I don't have a dryer. I use the whirly gig outside when I can and I have a similar airer to yours I bought on holiday in France (doesn't everyone buy a clothes dryer as a holiday souvenir? The year before I bought metal 'canes' to stake my tomatoes from an Alsace garden centre and the year before that a German plum stoner). I also have a wooden airer I got on freecycle that goes perfectly either in front of our boiler or in front of the wood burning Rayburn. I do line dry a lot- I'm lucky that i have enough room in my apartment to set up a couple of racks. Indoors only, though. I have horrible allergies and drying outside is a good way to get pollen all over everything you own. There's a coin op washer & dryer in my apartment building so it saves me $1.50 per load in addition to being more energy friendly, and in the winter when the heater is running it adds much needed humidity inside my apartment. The only thing I consistently dry in the dryer are towels b/c I don't like the crunchy texture of line dried ones. @Diane - Sounds like the perfect setup. @Adrienne - Yeah, allergies would be a deal breaker there. @Anon - Spiders and blowing red dust? Yep, I wouldn't go there either. We do a combination of drying, outside on lines, inside on racks and 1 load/week in the dryer. We dry inside in the basement which is dry with the help of the dehumidifier....I also have been known to run a box fan on low aimed at the side of the rack if it's full - to help with airflow. When it's pollen season - springtime nothing drys outside - it's just too brutal to have the allergens fall on our clothes and worse yet - bedding - the dryer gets more use then. I don't have a dryer. Line dry outside all year, with the exception of a few bad weather days where I dry indoors. I do live in Arizona though and that makes it super easy.